Our daughter Leyla is eleven years old and she loves playing Minecraft. 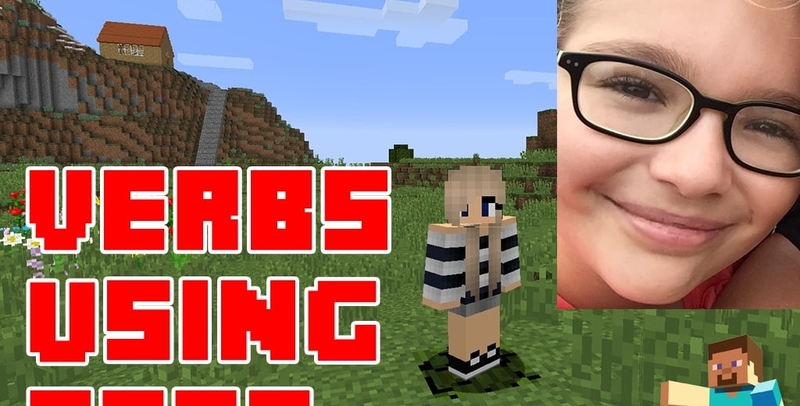 She has put together this short and fun video to illustrate which verbs use “être” in passé composé using Minecraft. Enjoy! Hi all – today, we’re going to learn about the French tense “le passé composé”. More precisely, the verbs which take “être” (to be) in passé-composé. I spent a lot of time producing this video (it’s more difficult than it seems, especially since I’m only 11 years old!). I hope you like it ! Here is the transcript of my video. It starts in English but it features French and audio so you learn the correct pronunciation of the verbs. Seeing the action in the video will help you remember the verbs which take to be in the passé composé – enjoy! Bonjour, and welcome to French Today! My name is Leyla, I was born in the US, I live in France now, and I’m bilingual. I’m 11 years old, and I love playing Minecraft. My video is based on French Today’s blog article “When to use “être” or “avoir” with passé composé”: I’m going to illustrate it using Minecraft. So, here we go. My character’s name is Leylack, and I’m going to describe what she did in French, using a tense of the past called “le passé composé”. Please understand that with that tense, I am describing what she did, NOT what she is doing now. She was born over there, in the village. She walked by these pretty flowers. She reached the bottom of the mountain. She went towards the house. She went inside the house. and then she exited the house. She went down the mountain. she fell… but fortunately, she didn’t die! and she went back to her village. Hier matin, je me suis levée, je me suis douchée, je me suis coiffée et je me suis habillée. Yesterday morning, I got up, showered, combed my hair and got dressed. Voilà, c’est tout pour aujourd’hui. Check out French Today dot com for blog articles and your free audio book to learn French like it is spoken today. If you enjoyed this video, make sure you subscribe to French Today’s YouTube Channel so you never miss a video! Leyla has made several ones using Minecraft!